Welcome to the Free Online Calculator Use blog page. Subscribing to this blog lets you know whenever a new calculator has been added to the site, or when an existing calculator has been updated or upgraded. To subscribe to my calculator blog (no email necessary), right-click on the orange RSS button below, and then paste the URL into your RSS reader. Or, click on the Feedly or My Yahoo! button if you keep a personalized home page at one of those sites. You can also be alerted to new and updated calculators by following me on either Facebook, Twitter, or Google Plus, or by subscribing to my Monthly Whats New email update (subscription form in right-hand column or below all calculators). Calculate your 18-hole or 9-hole handicap index. 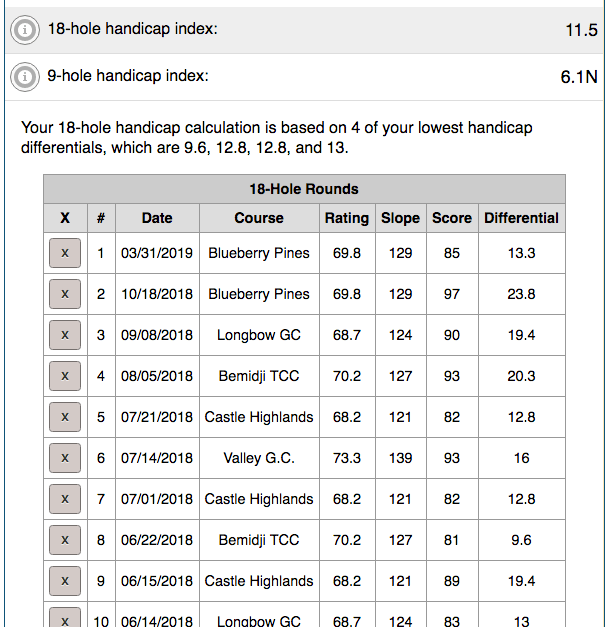 Convert your handicap index into course handicaps. Automatically sort rounds as you enter them, saving you from having to re-enter the course name, rating, and slope for every round. Allow you to save courses, rounds, and tees between uses. How to Calculate Your Golf Handicap. As always, please use the expandable feedback form beneath the calculator to let me know if you discover any issues and/or have any suggestions for improvements. P.S. The new calculator was also added to the Ad-Free Member Version. Calculate a trip's gas cost based on distance (miles or kilometers), fuel economy (MPG, L/100Km, L/M, or KM/L), and the price of gas (gallon or liter). 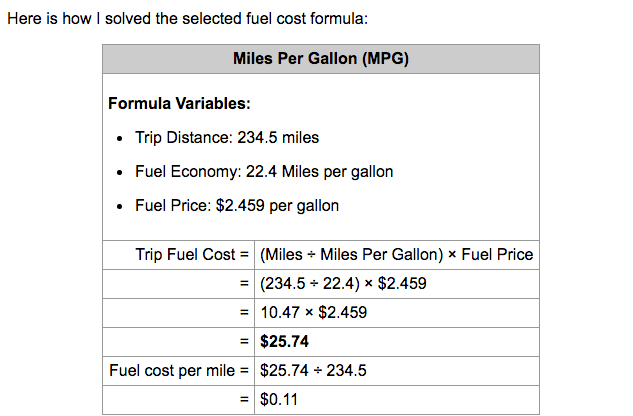 Calculate the gas cost per mile or per kilometer. Split the trip's fuel cost between travelers sharing the cost. Display the formula used along with its solution. Happy first day of spring tomorrow! Upon learning the Mortgage Recast Calculator was going to be linked from an article in the Wall Street Journal, I went through all of the feedback on the calculator and added the following most common requests. From the number of payments remaining. Or, from the month and year of the mortgage maturity date. If your mortgage lender offers annual recasting, you can now see how much you will save by making the same principal reduction every year the balance is greater than the reduction. The calculator now has a Load Sample Entries button, allowing you to simply edit the pre-filled fields. The printer friendly report now includes calculator entries, results, and if you opt for it, the re-amortized payment schedule. If you are a subscriber to the Wall Street Journal, here is the link to the "To Reduce Payments, Recast Your Mortgage" article containing a link to the calculator. P.S. The updates were also added to the Ad-Free Member Version of the calculator. Add multiple whole numbers and/or decimals, and show its work. Show you how to solve the problem without a calculator. Explain each step involved in solving the problem. How to Add Multiple Numbers Without a Calculator. Wishing you an excellent 2019! Add or subtract positive or negative decimals or integers, and show its work. Continue reading "New! 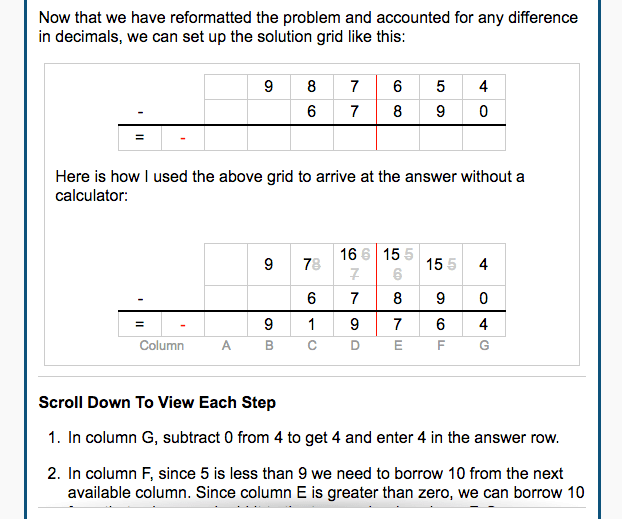 Adding and Subtracting Decimals Calculator"
After getting feedback stating the Multiplication Quiz was too difficult, I decided to create an additional tool for learning times tables. Display any size times table up to 1-12. Display a blank entry field for each multiplication in the table. Tell you if your answer is correct or incorrect after tabbing out of the field. Allow you to switch between a Practice view and a Study view. Allow you to print out a blank multiplication table, as well as a filled-in table, so you can practice and study offline. Continue reading "New! 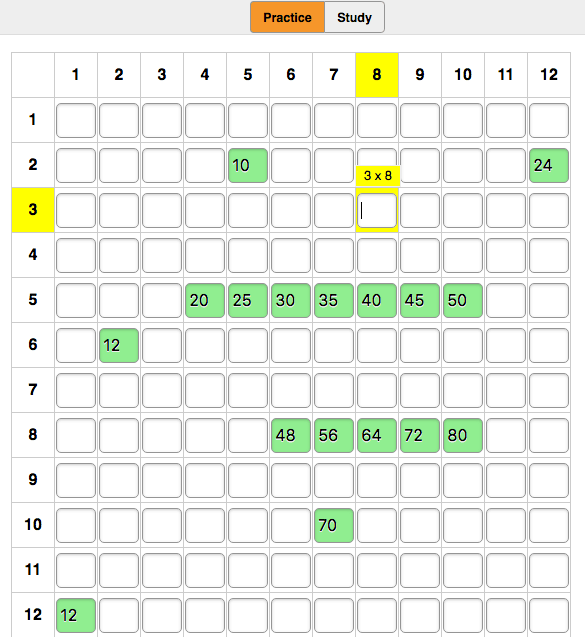 Multiplication Table Exercise to Learn Times Tables"
I would have never guessed there would be a need for a calculator that multiplied numbers. That is, until I added a suggestion form beneath each section's calculator listing. Low and behold, requests for a "Multiplying Decimals Calculator" started pouring in! 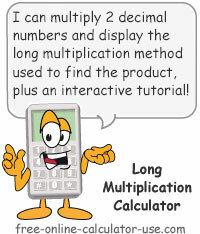 So I'm thrilled to report that I just launched a new Long Multiplication Calculator that shows how to multiply decimals, integers, and whole numbers ... without a calculator! Give the product of the two numbers. Display the long multiplication grid used to find the product. 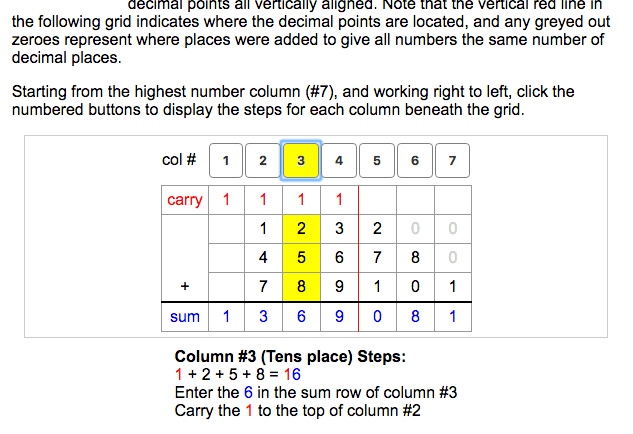 Display buttons for each Multiplier digit, which when clicked will show its carryovers and multiplication steps. From my perspective, it's one the coolest calculators I've ever created. I hope you agree! Continue reading "New! Long Multiplication Calculator for Multiplying Decimals and Integers"
After 18 months of working on it, I'm thrilled to report that I've finally launched the new design! Of course, I may still have a lot of work to do depending on your feedback. And as thrilled as I am, I also know I can't please everyone. So if you're not happy with the new design, I sincerely apologize. The majority of my site's users are now accessing the site from small-screen, touch-enabled, mobile devices. Google is now penalizing websites for not being mobile/thumb friendly. I could no longer keep up with trying to maintain and improve three separate versions of the site (mobile, desktop, and member). ... so I felt I was left with no choice but to combine all three sites into a single, responsive, mobile-first design. The good news is that now that I have combined the three separate versions of the site into a single design, this will eventually free up a ton of my time for working to make the mobile-optimized calculators more desktop/laptop friendly. In fact, some of the redesigned calculators already offer a desktop-optimized form that becomes visible when you increase the width setting of the calculator (setting within the "Calculator Preferences" expandable panel). Finally, if the new page layout is not working for you, please Contact Me and let me know what device, operating system, and web browser (with version numbers) you are using so I can attempt to get the layout working for your setup. Thank you in advance for your help and patience as I work to improve the redesign. If you're a regular reader of this "What's New" page, you're probably aware that I've been working on a site redesign for what seems like forever (March of 2017). I won't bore you with all of the setback and restart details. Let's just say I've given up on countless occasions only to later re-acknowledge that I need to see this through to the end -- for better or worse. Fearing repeat visitors wouldn't like it, I initially launched a demo page of the new design last summer hoping to ease my fears of breaking what might not need fixing. Unfortunately I have yet to receive even a single word of feedback. Recently a wise associate suggested that instead of waiting for someone to give me feedback on the demo calculator, I should just launch the redesign on 5 of my more popular calculators and measure what happens. That way, if the testing proves the redesign to be a major fail, I can just turn those pages back to the old design and get back to creating and improving calculators using the old design. So that's what I've done. The following 5 calculators have been converted to new design. If you feel strongly for or against the redesign, please let me know. Otherwise, if I don't hear from you, I will assume you don't have a preference one way or the other. In case you're wondering why I haven't created any new calculators of late, I thought I would let you know that I'm still busy working on the site. It's just that most of the work involves critical projects that are not visible. Earlier this year, the European Union enacted a law referred to as the General Data Protection Regulation (GDPR) to supposedly help their citizens to get control over their online personal data. And even though my website is based in the U.S., I was still forced to comply since a small portion of my traffic are citizens of the EU. Considering the stiff fines for non-compliance, I had no choice but to spend nearly the entire month of May implementing changes to comply with the 85-page law. I have been working on a site redesign of the website since March of 2017. It was supposed to save me time since it will combine the three separate versions of the site (desktop, mobile, member) into a single version. But each time I get close to completing it, something major happens that either causes me to take time away from the redesign (Google HTTPS compliance, EU GDPR compliance, etc. ), or to start over from scratch (Google mobile page-speed compliance, discontinuation of the mobile framework I used for the redesign, etc.). Once again I'm about a month or so away from launching the redesign, but this time I won't be surprised if the powers that be come out with yet another law or policy/ranking/framework change that forces me to start over a 4th time. This calculator was created in response to a site visitor who was looking for an easier way to track the running balance of loans made to others in the form of promissory notes. Furthermore, the notes have no prescribed payment, accrue 10% simple interest on a daily basis -- based on a 360-day year, and borrowers randomly decrease (pay down) and increase (add to) the principal owed. Wow! It's no wonder the visitor was looking for an easier way to keep track of who owes how much at any given time. I'm hoping this new Daily Interest Loan Calculator will be useful to aforementioned visitor, as well as to others who are also trying to keep track of these types of promissory notes, personal loans, or owner-financed arrangements. Calculate daily interest between dates or for a specified number of days. Choose between simple or compounding daily interest. Choose to base the daily rate on a 360, 364, or 365 days per year. Calculate interest and payoff for a single period, or create a printable running-balance schedule for multiple transaction periods. Change the annual interest rate for any interest period. And, if you print out the running balance schedule, start from where you left off on your next use of the calculator. P.S. The new calculator was also added to the mobile version if you are accessing from a small-screen device, and to the Ad-Free Member Version. Continue reading "New! Daily Interest Calculator for Tracking Promissory Notes and Personal Loans"
Just letting you know that I just finished updating the Budgeting Percentages Average Calculator with the latest figures from the Consumer Expenditure Survey conducted by the U.S. Bureau of Labor Statics. Simply enter your annual before-tax income amount and the calculator will instantly show you the average budget percentages and expenditures for other households in your income bracket -- for 14 main spending categories and up to 97 sub-categories! Plus, you can then create a sample budget based on income that you can print out and use as a reference point for revising or setting up your own budget. P.S. The update was also added to the mobile version if you are accessing from a small-screen device, and to the Ad-Free Member Version if you wish to save your entries in between visits. Continue reading "Automatic Budget Generator Based On Income"
How Will The New Tax Bill Affect My Paycheck? Like every year around this time, I have updated the federal tax withholding rates in the paycheck calculator. However, given the major changes in the 2018 tax reform bill, this year I decided to keep the 2017 rates so you could compare your net pay before and after the tax bill is implemented by your employer. To see the difference between the two tax withholding tables, calculate your paycheck as usual and print out the report (leave the default Use 2018 Federal Tax Table selected). Next, select Use 2017 Federal Tax Table from the new drop-down menu, then click "Calculate My Paycheck" again. Then print out the report to see what effect the new tax bill is having (or will have) on your take-home pay. Continue reading "How Will The New Tax Bill Affect My Paycheck?" Hope you had a safe and happy new year. Since it's been a while since I last posted anything new on this page, I at least wanted to let you know I've been busy behind the scenes. After failing to get any feedback on the Site Redesign Beta Page (as in zip, zero, none, nada), I decided to build the new design into the Ad-Free Member Version of the site to see if I can get any feedback from the members. I'm happy to report that I have completed the member redesign and plan to launch it to the members this coming weekend. Hopefully I will finally get the feedback I need to ease my concerns about launching the redesign for the free-with-ads version of the site. If not, or if I get complaints from the members, I will likely delay the free site launch until any complaints have been addressed and until web traffic slows down for the summer. Wishing you a happy, healthy, and prosperous 2018! A few months ago I became aware that a person dear to my heart was struggling to overcome an addiction to pills and alcohol. Later, out of the blue, I received an email from this person asking if I could create a sobriety calculator to help them track the time they've been sober. Of course, since I love creating online calculators, and I love the person asking for my help, creating this new calculator was a Labor of Love in the purest sense of the phrase. This new calculator will not only count up the years, months, weeks, days, hours, minutes, and seconds that have passed since a past date and time, but it can even be set to automatically update the next time you visit the page. Plus, if the past event resulted in saving or earning money (quit smoking or working on a billable project), the calculator will even count up the money saved or earned. 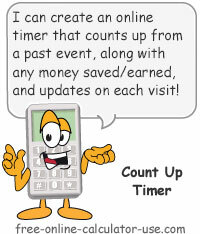 This explains why I named it the "Count Up Timer" instead of the "Sobriety Calculator", because it can be useful for counting time (and money) for many other types of past events. If you like the "Sobriety Calculator" and you know someone who is struggling to overcome an addiction, I invite you to share the new Count Up Timer with them. Continue reading "New! Count Up Timer for Counting Time (and Money) From Past Event"
Just letting you know that you should now see a green padlock in the address bar whenever you access a web page on free-online-calculator-use.com. That's because this past weekend, after many weeks of prep work, I converted the web site to "https". This means that all communication between the web site and your web browser will be encrypted. If you don't see the green padlock, please contact me and let me know the web address of the page I missed. In case you've been wondering why the new design hasn't been launched yet, I thought I'd give you an update. Just before the planned launch date of the new design (September 30th), I discovered an issue with a Google module that broke the new design. It took nearly two weeks to resolve the issue, but by that time it was too close to Google's HTTPS deadline to launch. Sometime after October 17, 2017, Google's Chrome web browser will start displaying a "Not Secure" message in the address bar for websites not using the HTTPS protocol -- even for sites like mine that don't ask for any sensitive personal information. This is basically forcing all websites to purchase a secure certificate and to switch the beginning of their web address from "http://www" to "https://www", or risk losing visitors who might get scared away by the "Not Secure" message. So Why Delay The Design Launch? As with any big change to a website, there are always unforeseen issues that show up after the change. Therefore I've decided to delay the launch of the new design until after the conversion to https and any https-related issues have been resolved. IMPORTANT! HTTPS Will Result In Lost Calculator Data! If you use any of the calculators that allow you to save your entries in between visits, it's important to know that data saved using the HTTP protocol can't be accessed from the HTTPS protocol -- even though the data is stored on your own web browser. Therefore, if you've saved any calculator entries to your web browser, please visit the applicable calculators and follow the instructions for transferring your data from http to https. Or, at the very least, print out the reports so you can re-enter the data once the conversion to https has been made. Note that this does not apply to members of the secure, Ad-Free Version. When Will The Conversion To HTTPS Occur? I already have the site set up to be accessed by the HTTPS protocol. In other words, you can access the secure version of any calculator by adding "https://" in front of "www.free-online-calculator-use.com" in your web browser address bar. The next and final step will be for me to turn on a redirect that will force all HTTP visits to go to the HTTPS version. But due to the loss of saved calculator entries that some users will experience, I will delay turning on the redirect for as long as I can. P.S. Switching to HTTPS means I will lose the social Like and Share counts I've spent 7 years working to earn. Your help in regrowing my HTTPS social Like and Share counts will be greatly appreciated! New! Millionaire Calculator with Redesign Sneak Peek! I have added a new calculator to the site for the primary purpose of getting your feedback from a sneak peek at the new design I've been working on since April. As I posted back in May, the redesign is necessary to allow me to eventually combine the mobile, desktop, and member versions of the site into a single code base. In turn, this will allow me to spend a lot more time adding and upgrading calculators. I still have a lot of work to do to build the redesign into all of the calculator pages, but I hope to be ready to launch the redesign within the next 2-4 weeks. This preliminary launch will combine the mobile and desktop versions into one. The final step will be to build the redesign into the member version, which I hope to complete by year end. If you typically access the site from a mobile device, you likely won't notice much of a change. That's because the mobile versions of the calculators are being incorporated into the new design (they already resize to fit any device). On the other hand, if you typically access the site from a laptop or desktop computer, you will notice a significant change in the calculators and in the site navigation. I hope you find the changes to your liking, but please let me know if you don't. In either case, the new redesign includes new features for saving entries and notes, as well as features for quick access to your favorite calculator(s). That is, if you are using a newer version of your web browser software. If you are using an outdated version of your web browser software (Firefox, Internet Explorer, Chrome, Safari, etc. ), the redesign and save features may misbehave until you upgrade your browser to a newer version. I sincerely apologize if this is true in your case, but I've held off adopting the required technologies for as long as I possibly could. Do You Prefer the Old "Desktop" Design? If you find you like the old, outdated calculator design on the desktop version better than the new design, please let me know. I may decide to link to the old desktop versions from the redesigned versions. However, just know that the old versions will no longer be updated or supported. As always, please use the expandable feedback form beneath the calculator to let me know if you discover any issues and/or have any suggestions for improvements -- either with the calculator or the new design. Continue reading "New! Millionaire Calculator with Redesign Sneak Peek!" In case you've been wondering why I haven't posted anything new lately, it's because I've spent the last 2 months working to combine all three versions of the website (desktop, mobile, member) into one responsive design. The Problem: Being a one-person show, trying to maintain three separate versions of 241 calculators leaves little time for creating and improving calculators. The Solution: Combine all three versions of the site into a single design that will resize to fit the screen of any device, and will accommodate both touch and mouse interaction. The Plan: I have a new calculator ready to release, so the plan is to build the new design into just the new calculator at at first. I will then ask you to give me feedback on the new design until I get it right, before building it into all of the calculators. 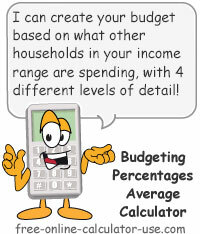 My goal is to have the new calculator -- with the new design -- published to the site by this time next month. I will then post a link here so you to take a look and let me know what you think. In the meantime I sincerely thank you for your patience. P.S. If you want to be one of the first to see the new design, be sure to subscribe to my Monthly "What's New" Email Update (signup form in right-hand column of all pages). 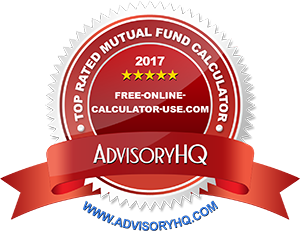 On Wednesday, March 15, 2017, the Mutual Fund Calculator on free-online-calculator-use.com was included in the Top 5 Best Mutual Fund Calculators as reviewed by AdvisoryHQ! Thank you to all those who contributed the feedback that helped to make the calculator worthy of such recognition! Wishing you a happy and safe St. Patrick's Day! Continue reading "Mutual Fund Calculator Gets "Best Of" Award from AdvisoryHQ"
Thanks to a request from one our Ad-Free, Cloud version subscribers (Cindy), I have just added a new self-calculating, monthly timesheet template to the site. This new calculator will calculate the regular time, over-time, and gross wages for employees that are paid on a monthly basis. The calculator includes built-in save and print features, plus a method for tracking weekly overtime for workweeks that span more than one month. And finally, the calculator also includes a monthly printable timesheet so you can print out the completed monthly time-log sheets and submit them to your payroll clerk. P.S. The new calculator was also added to the mobile version if you are accessing from a small-screen device, and to the Ad-Free Member Version if you wish to save your entries in between visits. Continue reading "New! Monthly Timesheet Calculator with Overtime Calculation"
Update: New Features Added to Sales Tax Calculator! 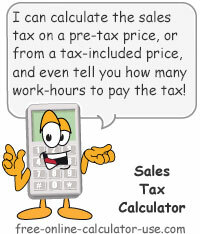 I have just finished an upgrade to the Sales Tax Calculator and the page it resides on. The calculator now has a state drop-down menu on the Sales Tax Percentage line. So now, if you're not sure what your state sales tax rate is, you can select your state from the drop-down menu and the calculator will fill in the rate for you. Plus, the state select menu will also populate a local rate field with the average local rate in your state. You can then edit the average rate and have the calculator add it to the state rate for you! Not sure what sales tax rate you were charged on a purchase? No problem, just enter the base purchase price and the total paid, and this mini calculator will tell you the rate you were charged. The page also includes a sortable chart showing the current state and average local sales tax rates for all states. If you sort by State Rate you'll be able to instantly see the states with no sales tax. Continue reading "Update: New Features Added to Sales Tax Calculator!" I just finished my second "How to" video. This one attempts to demonstrate how to use the Lender Loan Balance Calculator. So if you ever need to track the balance of a loan (either as a lender or as a borrower) when irregular, skipped, extra, or partial payments have been made, hopefully this new video will help you quickly get up to speed with the Loan Balance Calculator. Click the following image if you wouldn't mind giving me some feedback on the video (please use the expandable feedback form beneath the calculator). Please pardon my nerdy voice. I hope to get better with each new video. And please, if you run across a calculator on the site you don't quite understand, please let me know and I will put at the top of my list of "How to use the ______ calculator" videos I'll be recording. P.S. I also added a mini Negative Amortization Calculator to the page to help illustrate the difference between US Rule and Normal amortization methods. Continue reading "New Video! How to Use the Lender Loan Balance Calculator"
Recipe Conversion Calculator Gets Major Upgrade! I have just completed a significant upgrade of the Recipe Conversion Calculator, which includes several requested features. You now have the option to paste-in a recipe all at once and have the calculator attempt to load the ingredients into the form for you. Added several new units of measurement to the "unit of measurement" select menu. This includes dry teaspoons, dry tablespoons, dry cups, grams, and kilograms. You can now opt to have the metric equivalents of the converted units included in the printable report. For dry measurements, the converter even attempts to match the ingredient with its own unique weight factor. P.S. The upgrade was also added to the mobile version if you are accessing from a small-screen device, and to the Ad-Free Member Version if you wish to save your entries in between visits. Continue reading "Recipe Conversion Calculator Gets Major Upgrade!" 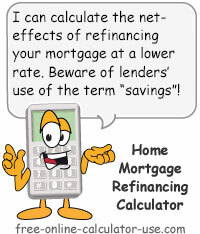 Home Loan Refinance Calculator Gets Major Upgrade! I have just completed a significant upgrade of the Mortgage Refinancing Calculator, which includes many requested features. I have also added brief answers to the questions I've been asked about refinancing. You now have the option to enter the "Current Payoff Amount" instead of just the original loan terms. Built-in closing cost estimator (no closing costs, low, medium, high) with 10 new entry rows detailing various fees. Options for "Cash out" or "Cash in". Option to have calculator estimate changes in LTV and PMI. Added a mini Average Mortgage Closing Costs Calculator to the page. Wishing you a happy, healthy, and prosperous 2017! Continue reading "Home Loan Refinance Calculator Gets Major Upgrade!" I created this new calculator to help me keep track of our youngest daughter's pregnancy term, but thought I'd add it to the site in case others might find it useful. Now, whenever someone asks me how far along she is, I can refresh the calculator and tell them exactly instead of trying to do the date math in my head. Just enter the baby's due date and this calculator will tell you, in days, weeks, and months, how far along and how long is left in a pregnancy term. The calculated results also include a due date countdown meter, and a printable countdown calendar -- wherein each date cell displays the days, weeks, and months along and remaining, as well as the date's trimester. Plus, you can even tell the calculator to remember the due date so the results will automatically recalculate whenever your revisit or refresh the page. Continue reading "New! Pregnancy Countdown Calculator with Printable Calendar"
Bond Value Calculator Now Shows Its Work! In response to a popular request, I have now added "the math" to the Bond Value Calculator. This means the calculator's page now includes the bond valuation formula, along with an example showing how to calculate the value of a bond using the formula. Plus, the calculated results now includes the step-by-step math used to arrive at the bond price, as well as a chart showing how the present values of the par value and coupon payments add up to the calculated price. Continue reading "Bond Value Calculator Now Shows Its Work!" Update: Two New Features Added to Paycheck Calculator! I have now updated this popular calculator to include two often requested features. The calculator now has a state drop-down menu on the State tax rate line. So, instead of having to look up your state tax rate, you can now just select your state and have the calculator look up your state rate for you. Plus, the calculator will even display your state's tax table along with your annualized gross pay! In addition to the pie chart that displays the breakdown of your gross pay, each slice's title is now followed by the percentage it represents. 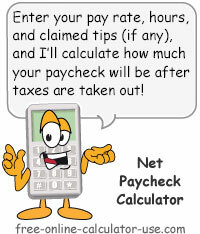 Continue reading "Update: Two New Features Added to Paycheck Calculator!" This new school calendar calculator will calculate the number of class days remaining in the school year. Simply select the starting and ending dates and the calculator will generate an interactive school calendar wherein you can exclude "no school" days based on your own school's calendar. Plus, the calculator even provides a printer friendly calendar with the number of days-left displayed in each date cell! Continue reading "New! School Calendar Calculator for Calculating Class Days Left"
Update: New Features Added To Extra Payment Mortgage Calculator! Weekly Extra Payment Field: In addition to one-time, monthly, and annual, you can now enter a weekly extra payment amount. Printer Friendly Report: After clicking the "Calculate Extra Mortgage Payment Savings" button, a printer friendly report button will display in the results. Clicking this button will open a full report in a printer friendly window. Continue reading "Update: New Features Added To Extra Payment Mortgage Calculator!"